This last Tuesday Marcus and I travelled to Bennington, NE. 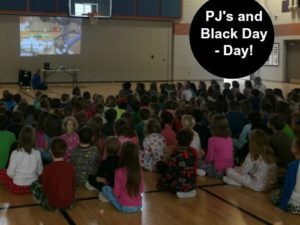 We shared the animated short and book Black Day: The Monster Rock Band with the students. The kids were all in their pajamas as it was “pajama day.” And also Dr. Seuss week. So the PTO invited a local author in to tell his story.